A blog where I post my research on a certain Okinawan named Chibana Choshin. Who am I? : A post of my "credentials." Bujutsu Blogger Shorin Ryuu: Martial arts and politics by a friend of mine from college. Martial Views: Pithy commentary on the martial arts from Mr. John Vesia. Karate Thoughts Blog: Articles on etiquette, training, and the history of karate in Hawai'i by karate historian Mr. Charles C. Goodin. Karate and Kobudo Blog: Tou'on Ryu practicioner Mr. Mario McKenna's essays on all things involving Okinawa karate and kobudo with a specific focus on Naha-te derived styles. Shinseidokan Dojo: Goju Ryu practicioner Mr. Mike Clark's website concerning his dojo and Okinawan karate in general. Okinawan Karatedo Institute: Mr. Theodore Kruczek's blog about karate. "Through physical training, one can cultivate the mind." We are not politicians. We are Budoka. We are patriots, no matter what country we live in and whatever that ideology may be. We do not deal with life through politics. We do not set our direction with politics. We set our direction by Budo or Karatedo. We are concerned with humanity, the well being of others, and the development of our own character. There is no context to this comment from Chibana Sensei. The context of Mr. Nakata quoting the quote was the 2006 mid-term elections in the US. While there is no basis in substantiating that Chibana Sensei actually said this, it is congruent with Chibana's writings, such as Karatedo no Kokoro e, as well as descriptions from other observers of Chibana Sensei's character and philosophy. The following is another sample of Chibana's calligraphy. As simple as it appears, the sentence is one of the more classically styled I have seen from his samples aside from his Karatedo no Kokoro e.
"Saving a person in distress is the way of humanity"
Interviewer: If you have any legendary hero stories about Chibana Sensei, please share. Katsuyuki: I first heard this story from Higa Yuchoku Sensei. One day after lunch, three gentlemen who were studying judo and kendo were on a world-wide martial arts pilgrimage and came to see Chibana Sensei (1). The three gentlemen had just come to Okinawa from Taiwan and asked Chibana Sensei, "Will you please have a match with us?" Of course, in order to avoid a meaningless fight, Chibana Sensei courteously refused. However, the three gentlemen insisted that it was absolutely necessary. This troubled Chibana Sensei and he answered, "I don't care if you hurt or maim me, but if you're okay with getting hurt or maimed, please join my class" (2). With that, the three gentlemen departed (3). To truly understand the story, let me explain. Okinawan Te (Ti) is a martial art. It took discipline to live a life with the purpose of kill or being killed. That's why researching hidden techniques that are forbidden in modern matches today was in vogue, and those who could uncover them were masters. It's impossible to use those techniques today without changing them to something completely different. Even kicking, researching the golden standard of kicking, and exploring hidden vital places including the most unpleasant vital spots (thrusting with your fist to a vital spot on the back of the head for instance) were practiced. Of course, the main principle was to make your hands and feet weapons to defeat your opponent with a fatal blow. Since Okinawan martial arts were for the purpose of protecting one's life, dealing with any kind of weapon was a life and death situation one keeps in mind and devotes time to studying. So with this understanding, when the gentlemen said, "Let's have a match. But, we know from our world travels about forbidden techniques, and because those techniques are dangerous, please don't use them," you can see how that troubled Chibana Sensei. However, is there ever a time when you should use your fists? I remember Chibana Sensei saying that the answer was this: "This is when you should use karate. You should use it to save someone from misfortune or to protect the ones you love." Interviewer: Do you have any other stories about Chibana Sensei? Katsuyuki: Here's another story again from Higa Yuchoku Sensei. This story was when Chibana Sensei was in his 70's, that's to say after the end of the war. There was a request from the American military garrisoned in Okinawa to give a karate demonstration on one of the American military bases. At that time, I think little Chibana Sensei saw the request and considered it for a little while. There were some skeptical individuals with submission wrestling experience in the audience. And so Chibana Sensei took one soldier on stage and with three fingers pointed at the soldier's chest said, "Come." If Chibana Sensei's tempered fingers moved before they were supposed to, the soldier could encroach. In addition, Chibana Sensei said, "You can tackle me or throw me too." The soldier started to savagely tackle him, but Chibana Sensei immediately repelled the soldier's arm with his forearm (4). In those days, Chibana Sensei said, "Your arms must be like iron. If you don't train, even if you have fat arms, they will only be as hard as wood. But, if you train, even slender arms can become as hard as iron." Of course, I personally train to make my forearms like iron. In the twinkling of an eye, the soldier's arm began to swell up. As the soldier stood in awe of such power, even as his hand turned purple, [Sensei] said, "I can teach you that technique," and invited the soldier to his dojo that evening. (1) The simplest explanation of 武者修行 or mushashugyou (what I've translated as "martial arts pilgrimage") was when an individual traveled to various locations to hone their fighting/warrior skills. Training, matches, and bodyguard or mercenary work were common facets of that lifestyle. (2) I had a hard time translating this sentence into English, even with expert help (who had a hard time making it make sense in English). While I think I've captured the essence, here's the sentence in its entirety: "さすがの知花先生も困り果て、「あなた方は首を絞めても、何をしてもかまいません。しかし、こちらも同様のことを了解して頂ければ立ちを会いましょう」と答えました." (3) The verbiage in the article was, "すると、三人組はそのまま帰ってしまった." Katsuyuki Sensei was trying to point out that the three of them promptly left when Chibana Sensei became serious. (4) I suspect that the blow the soldier suffered was an uchi-uke, one of Chibana Sensei's alleged go-to techniques around that time. I've heard two stories of other individuals who, wanting to test Chibana Sensei, were rendered similarly helpless with an uchi-uke. Regardless, the most important things to take note of are (1) Chibana Sensei used a "block" as a strike and (2) his power was that of ippon kowashi - "one blow to destroy the opponent." Note how the soldier stopped attacking after his arm had been struck. It's been a while since I've devoted time to The Chibana Project. Life happened these past three years. Digging through my files to answer a request, I discovered some additional unfinished translations. I've decided to finish them and resume posting them here. Other surprises may be in store over time as well. There is a wonderful book written by Masahiro Nakamoto called Okinawa Traditional Old Martial Arts that has been translated into English and is available here. What is being sold is the second English edition. I have a copy of the first English edition, which was published and translated by Miguel de Luz in July 2008. While I haven't read this particular second edition, I have been informed that there aren't significant differences between the two in terms of what mattered most to me: information on Chibana Sensei and the 38 other bujin Nakamoto Sensei meticulously researched. There are two Japanese editions to my knowledge (I have copies of both) published in 2006 and 2007 respectively. - You can e-mail me at jonqpublic@lycos.com. - Chibana Sensei's house has long been bulldozed and built over. I discovered this when I returned to Okinawa in 2007. Before I left Okinawa in 2009, there were a number of new apartment buildings being built in the Tori Hori neighborhood. It broke my heart not being able to see the house again, but I feel fortunate that during my 2006 trip I photographed the property when the house was still standing. - If you find yourself in Naha, Okinawa, head south of Shuri Station along Highway 82 and then turn left once you've hit the Higa Apartment (比嘉アパート) complex and head east into the neighborhood. You'll find yourself in Chibana Sensei's old neighborhood. If you speak Japanese, you might be fortunate enough to run into an elderly person in the neighborhood who may have been a neighbor. That's how I found the Chibana property when I ventured by myself in 2007 to discover that it had been bulldozed over. In August of 2006, I set out to translate Shuguro Nakazato's Okinawa Traditional Karate: Shorin Ryu Kata figuring there would be much about Chibana Sensei within the book. As I waded through an attempt at translation, I lost interest primarily because the book was - appropriately I would respectfully add - a mini biographical account of the life of Shuguro Nakazato. He begins speaking about Chibana Sensei on page 217 of the book. By page 220, the focus begins to return to him, and my translation ends. I was recently contacted for the rest of my translation notes from the book. Rather than just sharing with one individual, I thought I would post it here. This fragment is interesting for a couple reasons: first, Nakazato Sensei's narrative brings out the true Uchinanchu essence of Chibana Sensei. Second, just as with that first fragment I translated five years ago, you see Nakazato Sensei's love and respect for his master. What follows is pages 219 through most of 220 ( a direct continuation of my post from August 2006 ). Any errors in translation are mine. Shortly thereafter, because Sensei had left Chinen to return to his birthplace of Shuri's Tori-Hori district, Sensei had opened his first dojo there in Taisho 7th year (1918). 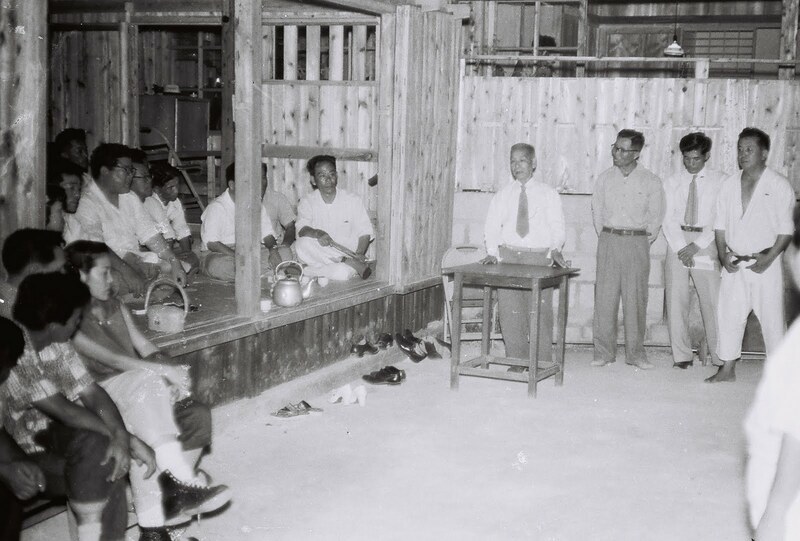 In the time when Chibana Sensei opened his dojo in Shuri Tori-Hori village, Funakoshi Gichin, Oshiro Chojo, Yabu Kentsu, Hanashiro Chomo, Tokuda Anbun, and others whose illustrious names carried weight in the karate world founded the Karate Research Club dedicated to furthering the research of karate ideas and technique training. Chibana Chosin Sensei regularly said, "Karate is the way of cultivating the mind," and spoke of the essence of karatedo hidden in Okinawan song (1). Sensei used to say this old Okinawan saying, and would emphasize this with a thumping that resounded off his chest, renewing the importance of endurance and giving you something thoroughly to consider (2). I intentionally learned the bokusho style of writing the character "endure" because I was so deeply impressed with my teacher's ways (3). I also frequently write another character: "knowledge." Karatedo's foundation is surely perseverance because I think in order to excel at the techniques, the way one must master is "endurance" and "knowledge" without conflict. That's why I think these two characters "endurance" and "knowledge" are karate's ideal and practicing these characters expressed that sentiment. The purpose of the pursuit of karate surely exists in "perseverance," and in order to "be absorbed in karate and risk life on karate" the spirit of "knowledge" is necessary and essential. Master Chibana Chosin Sensei said very elegantly, "In karate I live, in karate I die." But, the ones supporting that kind of lifestyle are understanding families and respectful students. Everytime there was something needed, his students endeavored to meet that need as much as possible (4). 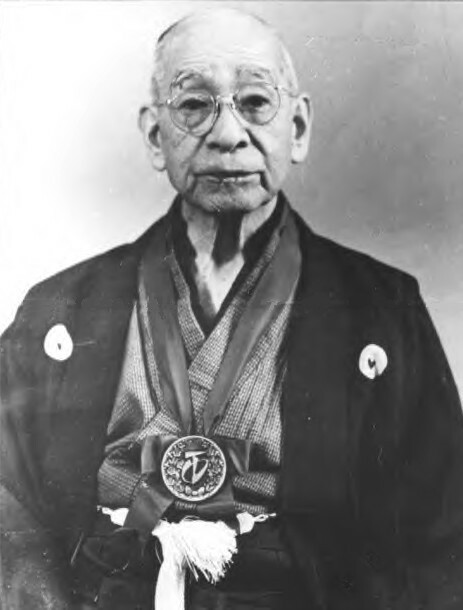 Two years after I began training in Showa 23d year (1948), Chibana Chosin Sensei founded the Okinawan Shorin Ryu Karate Association and became its first president. When I began training, I soon became an uchi-deshi, and as such I soon underwent various hardships (5). After the war, when Sensei was building his home in Tori-Hori, there was a shortage of goods and supplies. (1) One of Chibana Sensei's five precepts from Karatedo no Kokoro e was "Through physical training, one can cultivate the mind." (2) This is likely a reference to the proverb: 忍ぶで忍ばらんことあゆみ、忍ばらん忍びすしど忍び (Shinobu de shinobaran koto ayumi, shinobaran shinobi sushido shinobi). I cannot make this make sense in English. 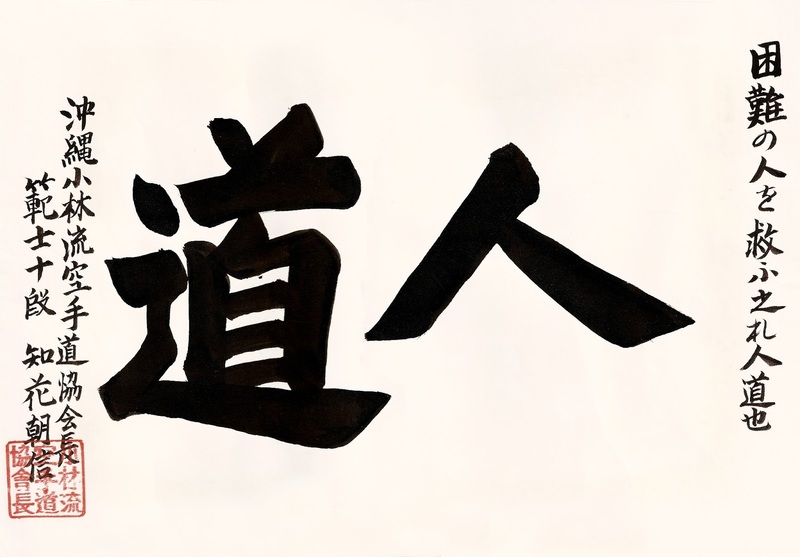 (3) Bokusho (墨書) is an abstract, post-modern form of calligraphy from the post WWII era in Japan. (4) Personal Note: After hearing his story with my own ears, Nakazato Sensei did much more than he would ever publicly acknowledge to support Chibana Sensei. (5) Uchi-deshi is a live-in student. Requirements to become an uchi-deshi vary from instructor to instructor but they generally share the themes of loyalty to the teacher and dedication to karate.